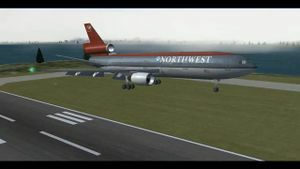 A Northwest Airlines DC-10-30 making an automatic landing in harsh weather. The McDonnell Douglas DC-10-30 is a long-range trijet commercial airliner. FlightGear's DC-10-30 is a realistic and relatively complete aircraft. Highlights include fully functional lights for Rembrandt rendering, complete flight controls with proper spoiler and autobrake simulation, and a very accurately-modelled autopilot. At first glance, the DC-10 may seem like any other airliner you may have flown in FlightGear. Actually, it is an obscure, challenging aircraft with a steep learning curve, especially for inexperienced pilots. Nonetheless, learning to fly this unique airliner is a truly rewarding experience. This tutorial shows you how to make a typical flight in the DC-10 using the autopilot, automatic braking, and autoland systems. It is fairly in-depth, and meant to be read from start to end. To start the aircraft, use the "Autostart" item in the aircraft-specific menu. The DC-10 has incomplete system simulations and this is currently the only way to start up. The first thing you should do is make sure the aircraft's doors are closed. :-) To open and close doors, open the "Doors" dialog in the aircraft menu. Then use the "Lights" dialog (in the same menu) to turn on the appropriate lights. At the very least, you should turn on the landing lights. Just use the HOME/END keys or your joystick to set the elevator trim within the zone. Our only concern is the three sections in the middle. Left-to-right, they control speed, heading, and pitch. To pull any knob, middle-click it. To push any knob, left-click it. To rotate any knob, use the scroll wheel on it. Push buttons by left-clicking them. Unlike other aircraft, buttons on the DC-10 become depressed while you hold down the mouse button to reinforce the idea that you are actually pushing them. Levers are the short, fat controls that move along black "tracks." 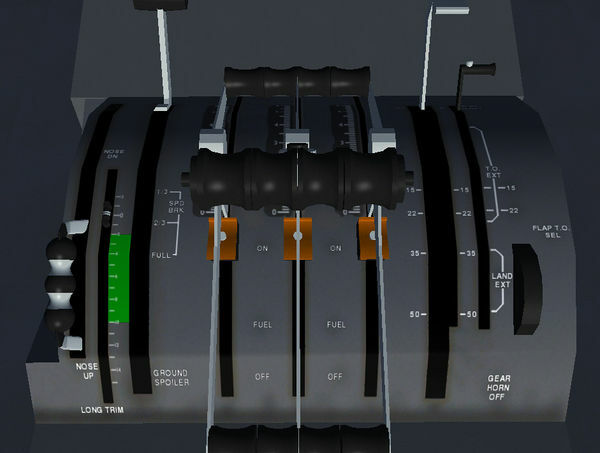 The levers for the autothrottle system (labeled "ATS") are toggled using left-clicks. This is because they only have two settings: on and off. The levers for the autopilot system (labeled "AP") move up with left-clicks and move down with middle-clicks. This is because they have three possible settings. Mess around with the panel now, getting a feel for the controls. You'll notice white messages appearing on-screen that announce what changes you have made. They help new pilots get familiar with the autopilot. If you happen to find them annoying later on, you can turn the messages off in the autopilot dialog (F11). Now, let's actually put George to work! He can't actually get the plane off the ground for us. But while we're still on the ground, we'll input our settings. We'll set the autothrottle to maintain 250 knots for our climbout. We do this using the speed knob. The speed knob is located in the "ATS" section of the panel; it has an orange triangle on its face. You can adjust the speed setting by scrolling on this knob. Scroll up until you have selected 250 knots- but wait! If you push the knob in (that means left-click and hold, remember?) and then scroll at the same time, the knob adjusts in increments of 10 knots instead of 1. Use this handy trick to make quick adjustments to your speed setting. * - The Inertial Navigation System is currently not implemented. Instead, selecting this mode will cause the DC-10's autopilot to follow the route entered in the Route Manager. All of these modes are fairly self-explanatory. Their usage is explained below. The heading controls are labelled "HDG" on the panel. Remember, there are actually two heading knobs; a black one in front and a grey one in the back. Left-click the grey heading knob to decrease the bank angle. Middle-click the grey heading knob to increase the bank angle. The current bank angle is indicated by the white arrow. Pull (middle-click) the black knob to select magnetic heading hold mode. Push (left-click) the black heading knob. Tune the VOR station on the NAV1 frequency. Set the desired course on the NAV1 radial. Tune the ILS station on the NAV1 frequency. Selecting ILS mode only tells the autopilot to fly the glideslope's heading. To follow it down to the runway, you need to set the pitch mode to LAND. 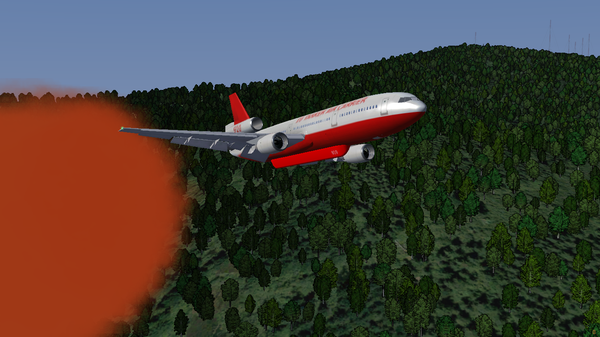 The DC-10-30 tanker variant is available for download here. This page was last modified on 27 January 2015, at 01:13.